REDWOOD CITY, CA--(Marketwired - Sep 22, 2015) - ThreatStream®, the pioneer of an enterprise-class threat intelligence platform, today announced the ThreatStream Splunk App as well as new integrations with leading security solutions. 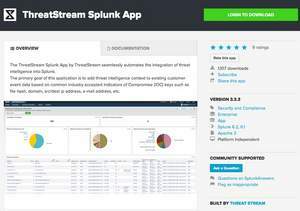 The ThreatStream Splunk App gives customers broader analysis and investigation capabilities and increases real-time visibility into the detection, identification and remediation of threats. ThreatStream has also added new partner integrations to the ThreatStream Alliance Preferred Partner (APP) Store and the ThreatStream Optic™ threat intelligence platform. The addition of leading network security, endpoint security and threat intelligence providers makes the ThreatStream threat intelligence platform (TIP) the most comprehensive and vendor-agnostic on the market today. "There's an insatiable need amongst enterprises in every industry today for information that is not only relevant and highly accurate, but also allow IT departments to be more robust and efficient," said Hugh Njemanze, ThreatStream CEO. "Today's threat and security analysts are overwhelmed with the amount of information available to them and are constantly faced with the arduous challenge to keep up with cyberattacks and security breaches. With our Splunk App, and the latest partner and technology integrations, ThreatStream organizations can have a single view of threats they can quickly make sense of, share and operationalize." Cybersecurity teams are faced with the tremendous challenge of keeping up with cyberattacks and data breaches. ThreatStream continues to innovate and provide technology solutions to help customers to effectively and rapidly detect, investigate, respond to and remediate threats and security incidents. ThreatStream provides an enterprise-class threat intelligence platform, combining comprehensive threat data collection, prioritization and analytics with secure collaboration and sharing. ThreatStream is introducing new features, partnerships and integrations to directly address this challenge, making the task of rapidly identifying relevant and actionable intelligence and running analysis achievable for every enterprise. The ThreatStream Splunk App reinforces the ThreatStream commitment of providing enterprises with the latest tools and relevant partnerships. Through the ThreatStream Splunk App, IT teams benefit from richer context, visualization tools and investigation workflow for rapid detection of and protection from cyberattacks and security breaches. The App includes interactive dashboards for intuitive analysis and investigation, real-time visibility into zero-day and zero-week vulnerabilities and more. Threat data feeds allow security teams to leverage third-party intelligence to improve an organization's ability to proactively protect itself from cyberattacks. Often purchased by security teams to supplement the threat intelligence being collected by in-house security controls, these feeds are an essential part of any organization's security strategy. This will give an enterprise instant visibility, rapid response and efficient analysis. ThreatStream provides a broad portfolio of integrated solutions that deliver unmatched visibility and continuous advanced threat protection to marketing-leading SIEMs, IDS/IPS, firewall and end-point solutions. The ability to inject machine-readable threat intelligence into your existing security solutions and correlate it with local data increases the velocity and accuracy of threat detection and enhances an organization's ability to respond to the most targeted attacks.